During the presidential campaign, Donald Trump pledged to “bring back waterboarding, and a hell of a lot worse.” That was a red line for us. We worked behind the scenes to provide that letter to the president-elect, his cabinet nominees and top aides, and congressional leaders. Our strategy was to ensure that to win confirmation, cabinet nominees would have to reject torture unconditionally. We succeeded. All five national security nominees— for CIA Director, Attorney General and Secretary of Defense, State, and Homeland Security—stated during their confirmation hearings that so-called “enhanced interrogation” techniques are illegal and unacceptable. CIA Director nominee Mike Pompeo, previously a supporter of the torture program, went so far as to say that if the president ordered him to restart it, he would refuse. Later, when a leaked draft Executive Order showed that President Trump intended to bring back torture, there was a bipartisan outcry. In declaring their opposition, several senators cited the 2015 McCain-Feinstein amendment, which we spearheaded. Supported by 87 Senators and signed by President Obama, that bill bolstered the ban on torture and rebuilt the bipartisan consensus against it. The law grew out of another of our advocacy efforts: securing declassification and release of the key parts of the Senate intelligence committee’s landmark report on the CIA torture program. 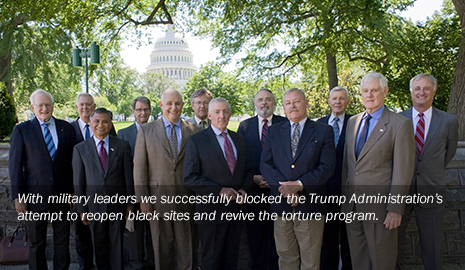 We were able to quash President Trump’s attempt to bring back torture because we had been leading on this issue for years.